I get very emotional whenever I see a letterbox. In this day of instant messaging, even email is limited to official communication or sending a barrage of forwards which often are sent umpteen number of times. Writing letters, sticking stamps, dropping them in the letterbox and then anxiously waiting for a reply have sadly become a part of folklore. I remember writing letters to my grandparents. 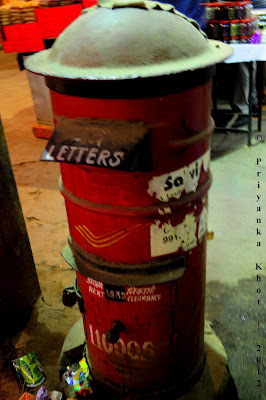 Some of those letters have stood the test of time and have been preserved by them for over 2 decades. One day, I'll show my children these letters and will try and explain the whole process of letter writing with great difficulty. This neglected letterbox in Karol Bagh has been reduced to a place where people throw garbage and stick posters. Say Na Something Anupam Uncle!